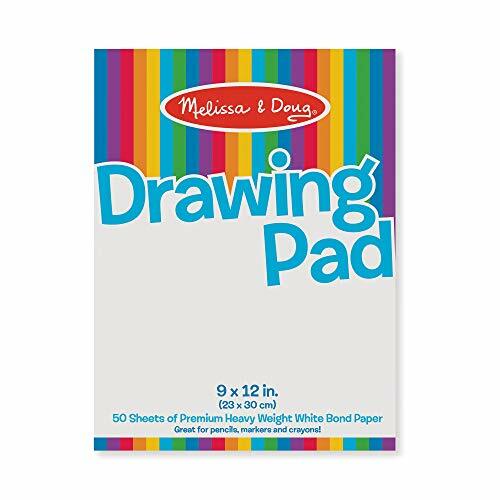 LARGE DRAWING PAD FOR KIDS: The Melissa & Doug Drawing Paper Pad is a single package of 50 sheets of premium heavyweight bond paper. The large pages are the ideal canvas for little artists' creative expression. EASY-TO-REMOVE PAGES: Our coloring pad features paper that's easy to remove from the pad with little tearing. This allows kids to effortlessly remove each page, and parents to display their children's artwork. WORKS WITH MULTIPLE ART SUPPLIES: This sketchpad for kids is made with heavy-duty paper, which makes it great for pencils, markers, and crayons. KEEPS KIDS ENTERTAINED: The Melissa & Doug Drawing Paper Pad is a high-quality art supply that helps kids explore their creativity. Maintaining an ample supply ensures kids always have materials for creative, screen-free fun. Watch a rainbow of colors appear like magic with Bendon LOL surprise imagine ink magic ink pictures! Artists of all skill levels will love finding miss punk and her friends hidden across 24 magic reveal pages. Its compact design makes it perfect for travel, too! Join your favorite characters from Daniel Tiger's Neighborhood, The delightful animated series inspired by Mr. Rogers neighborhood, in this mess-free 18-page color wonder pad. Works with all color wonder markers and paints. Colors appear only on special Color Wonder paper! 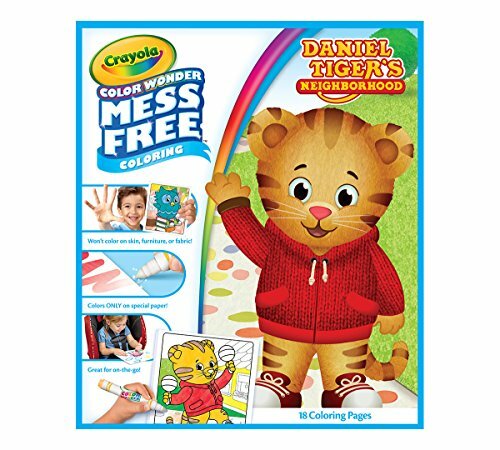 Daniel Tiger mess free coloring pages: includes 18 Daniel Tiger coloring pages (markers sold separately). Daniel Tiger characters: fans of Daniel Tiger's Neighborhood will delight in the themed coloring pages featured in this set. Color Wonder: keep your skin, furniture, and washable clothing clean with no mess markers that only show up on specially formulated color Wonder paper. Great for travel: no mess coloring supplies are great for long road trips and flights. Grow your collection: all color Wonder inks work on all color Wonder coloring books, and refill pages. Daniel Tiger gift set: safe and nontoxic gift for girls, age 3 & up. 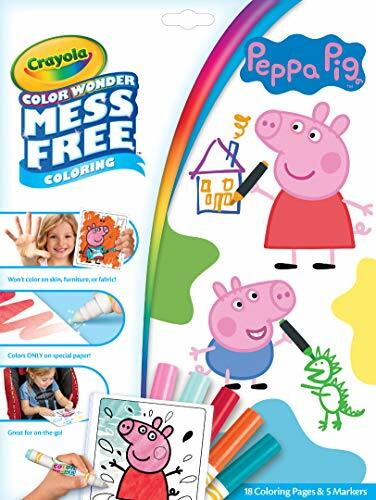 Contains 18 Peppa Pig Coloring Pages and 5 Color Wonder Markers. Featuring characters from the Nick, Jr. animated Peppa Pig show. Colors appear only on special Color Wonder paper, not on skin, clothing or carpets! Folder style packaging works as reusable storage for your coloring pages and markers. Works with all Color Wonder paints, markers, and stamps. CRAYOLA-Color Wonder Drawing Pad. 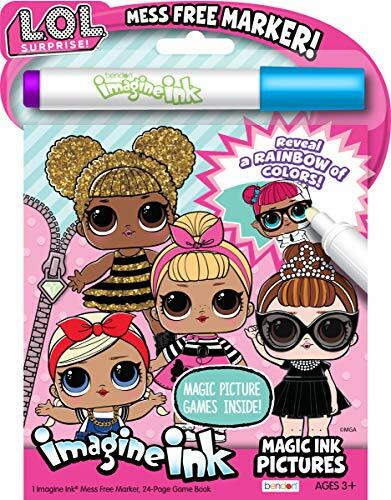 Now kids can color anytime and anywhere, mess-free! Color Wonder ink only colors on this special Color Wonder paper. This package contains one 13-3/4x8-5/8x1/4in tablet with thirty pages of mess-free coloring fun. Conforms to ASTM D4236. Recommended for children ages 3 and up. Made in USA. CRAYOLA COLOR WONDER PAD: Refill your Color Wonder Collection with 30 Mess Free Coloring Pages in one convenient pad. MESS FREE COLORING: No mess markers only show color on specially formulated Color Wonder Paper, not on skin, clothing, or furniture. WASHABLE MARKER ALTERNATIVE: Give your little one a bit more practice coloring, before handing them a box of Crayola Washable Markers with these vibrant no mess markers. COLOR WONDER REFILL: This refill pad works with all Color Wonder Markers, Paints, and Stamps. SAFE & NONTOXIC: A great gift for kids 3 & up. 1.Let the pens soak in water for 2 mins before use. 2.The speed of disappearance of a picture is influenced by temperature and humidity. 3.The pens are twisted in reverse direction (opened by clockwise and tightened by counterclockwise), to prevent baby from opening it easily. 4.No machine wash, brush wash or water wash.
No-mess painting for kids! This exciting paint-with-water coloring book includes four reusable pages and a refillable water pen. Simply use the pen to color in each scene--details and vibrant color appear with every stroke! Then let the page dry to erase the pictures and fill it in again and again. This underwater-themed book includes four scenes to color, and a search-and-find activity for each scene. The chunky-sized water pen is easy for kids to hold and stores neatly right in the front cover, so Water Wow! books make ideal travel activity books and travel toys for kids. The Melissa & Doug traveling coloring books are designed to be both educational and entertaining. They help to promote fine motor skills, early writing/reading skills, and visual discrimination. The Melissa & Doug On the Go Water Wow! Under the Sea Activity Pad is a delightful and educational gift for kids ages 3 to 7. Add a Melissa & Doug Reusable Sticker Pad to round out the hands-on and screen-free play experience. For more than 30 years, Melissa & Doug has created beautifully-designed imagination- and creativity-sparking products that NBC News called the gold standard in early childhood play. We design every toy to the highest-quality standards, and to nurture minds and hearts. If your child is not inspired, give us a call and we'll make it right. Our phone number is on every product! UNDERWATER-THEMED ACTIVITY BOOK: The Melissa & Doug On the Go Water Wow! 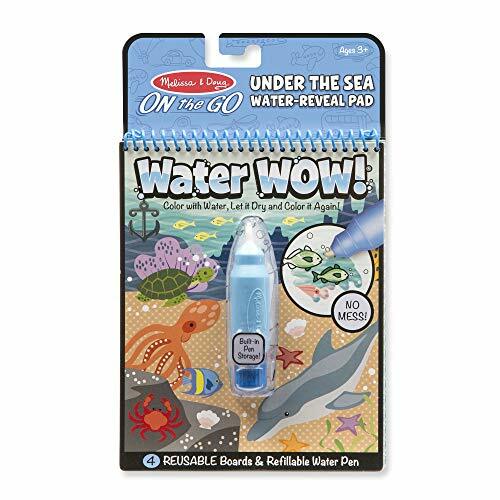 Under the Sea Reusable Water-Reveal Activity Pad features reusable pages that come to life when wet. 4 REUSABLE WHITE PAGES: Our sea-creature coloring book with water pen for kids features 4 reusable white pages that include simple line drawings when they are dry, then are filled with color when wet. CHUNKY-SIZED PEN: This Melissa & Doug sea life activity book comes with a chunky-sized water pen that allows easy filling and is designed for smaller hands to easily grasp. The compact, spiral-bound format is great for travel. GREAT GIFT FOR AGES 3 TO 7: This activity pad is a delightful and educational gift for kids ages 3 to 7 years. Add a Melissa & Doug Reusable Sticker Pad to round out the hands-on and screen-free play experience. No-mess painting for kids! This exciting paint-with-water coloring book includes 4 reusable pages and a refillable water pen. Simply use the pen to color in each scene details and vibrant color appear with every stroke! Then let the page dry to erase the pictures, and color it in again and again. This fairytale-themed book includes 4 scenes to color in, along with a search-and-find activity for each scene. The chunky water pen is easy for kids to hold and stores neatly right in the front cover, making the On the Go Water Wow! an ideal travel activity book and travel toy for kids. This water-painting activity set for kids is packaged in a convenient spiral notebook. The Melissa & Doug On the Go Water Wow! 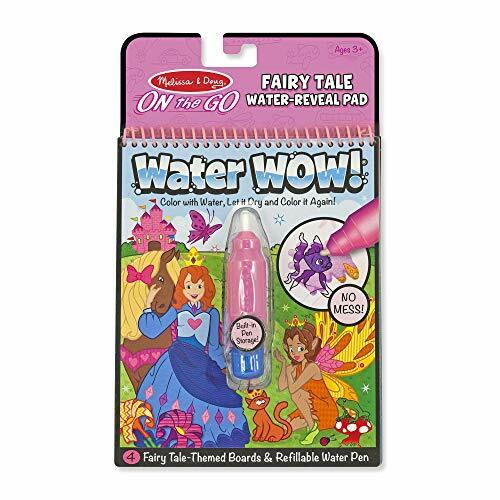 Fairy Tale Reusable Water-Reveal Activity Pad make a delightful and educational gift for kids from 3 to 6 years. Add a Melissa & Doug Reusable Sticker Pad to round out the hands-on play experience and give kids another engaging option for screen-free entertainment. For more than 30 years, Melissa & Doug has created beautifully designed imagination- and creativity-sparking products that NBC News calls the gold standard in early childhood play. We design every toy to the highest quality standards, and to nurture minds and hearts. If your child is not inspired, give us a call and we ll make it right. Our phone number is on every product! NO-MESS PAINTING ACTIVITY BOOK: The On the Go Water Wow! Fairy Tale Reusable Water-Reveal Activity Pad is a fairytale-themed watercolor book that includes 4 reusable pages and comes with a refillable water pen. 4 REUSABLE WHITE PAGES: Our water activity book for kids features 4 reusable white pages that include simple line drawings when they are dry, which fill with color when wet. CHUNKY PEN: This Melissa & Doug activity book for kids comes with a chunky water pen that allows easy filling and is designed for smaller hands to easily grasp. The compact, spiral-bound format is great for travel. GIFT FOR AGES 3 TO 6: This pad makes a great educational gift for kids from 3 to 6 years. Add a Melissa & Doug Reusable Sticker Pad to round out the hands-on play experience and give kids another engaging option for screen-free entertainment. 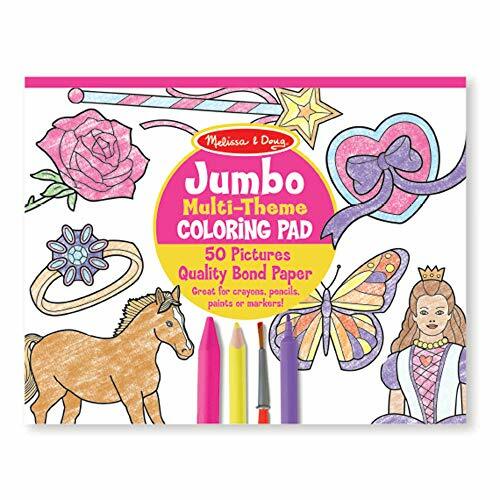 MULTI-THEMED COLORING BOOK: The Melissa & Doug Jumbo 50-Page Kids' Coloring Pad includes 50 fun objects such as hearts, horses, flowers, and more-constructed with easy-to-tear-out pages. OVERSIZED SHEETS: Our kids' coloring book features 11 x 14 oversized sheets, providing more room for creative fun! GREAT GIFT FOR KIDS 3 YEARS AND UP: The Melissa & Doug Jumbo 50-Page Kids' Coloring Pad makes an exceptional gift for kids 3 years and up. Add the Melissa & Doug Jumbo Animals Coloring Pad to round out the screen-free play experience. 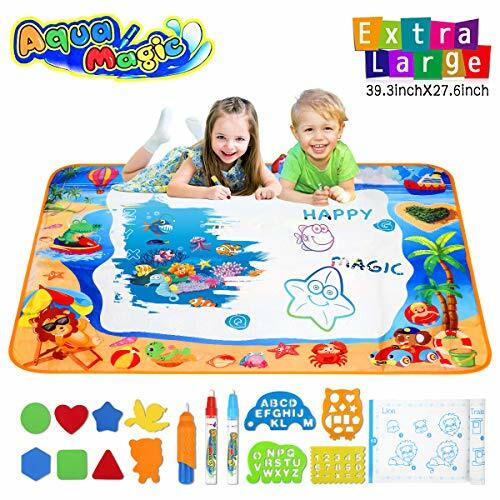 LARGE MEGA PACK Aqua Magic Mat, Kids Toys, Water Drawing Mat Toddlers Writing Mat Educational. EASY TO USE - Simply fill the magic pen with water and draw on the magic water doodle mat. The doodle needs 3- 5 minutes to disappear automatically. HIGH QUALITY - The Aqua Magic Mat is made of water-resistant Non-woven cloth material and filled with cotton, clean and safe for babies and toddlers. PACKAGE INCLUDE: 1 x water drawing mat, 5 x magic pens, 8 x molds. *BONUS * FREE STAMPER AND ROLLER SET. Fill the pen with water, draw, scribble or doodle over the mat and your drawings appear like magic in colour When the water dries, drawings fade away, ready to start all over again! Helps to develop hand eye coordination Supports pencil Grasp development Helps to stimulates the creativity of the child and broadens the imagination Any water that does run off the mat, runs clear. No mess, no stains, nothing to worry about Batteries Not Required No mess, no ink, no stains! IT'S NOT JUST FUN - but builds learning skills too! Of all the toys in the world, the most important one is your child's very own imagination. ENDLESS HOURS OF PLAY- All you need for hours of creative and imaginative play drawing, doodling and scribbling. Crayola color wonder inks appear only on special Color Wonder paper not on skin, clothing or carpets! This set contains 18 Disney Princess coloring pages and 5 color wonder markers. Folder style packaging works as reusable storage for your coloring pages and markers. Works with all color wonder paints, markers, and stamps. Makes the perfect addition to any Disney princess collection. Included art features Belle, Jasmine, Ariel and more. Great gift for girls ages 3 & up! 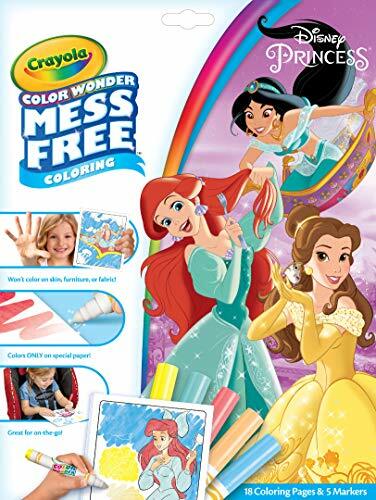 Color Wonder set: contains 18 Disney Princess coloring pages and 5 color Wonder markers. Mess free coloring: colors appear only on special Color Wonder paper, not on skin, clothing, or carpets! Organized & travel-friendly: folder style packaging works as reusable storage for your coloring pages and markers. Disney Princess characters: pairs well with other Princess toys, letting them play with their favorites like Princess Belle, Jasmine & Ariel even more! Color Wonder supplies: works with all color Wonder paints, markers, and stamps. Safe & nontoxic: gift for girls ages 3 & up! Our product made of hight quality ABS plastic,non-toxic,dust free,sturdy and durable,it is safety for kids to study and drawing. Come with the lovely stamp,copy card,replace pen and fruit stickers,it is really helpful tools for kids to play and drawing. 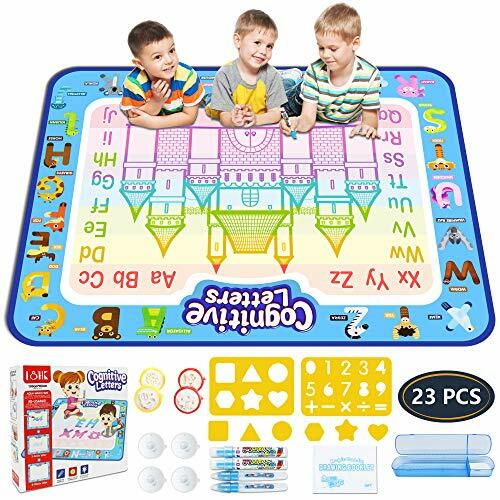 Big size board design, it made kids ability to draw more characters and objects,the child's imagination cannot be limited by the space of the drawing board, include more color,this will make the drawing more colorful. It is the best education gift for the kids,they will love this drawing board very much,it is also for the teacher,it is helpful for teacher to teach kids to draw with this drawing board. 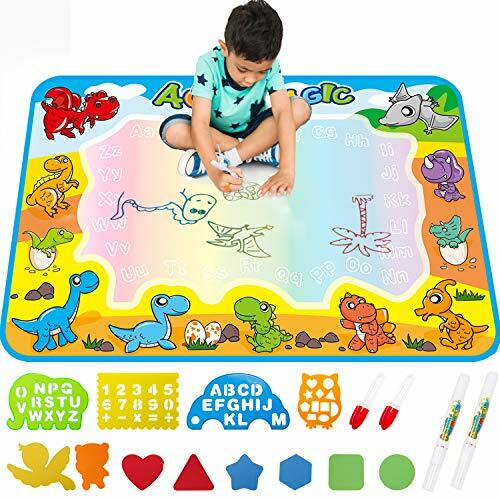 Large Educational Aqua magic doodle drawing mat for kids aged 3+. Do you still remember the scene you saw when you went back home last time? The little one was drawing wildly on the well painted walls. What a talented baby, but what a mess! Well, now we are offering a possible way to avoid that and allow kids to show their talent somewhere else. We present you Aqua Magic Doodle Drawing Mat! Smart and Colorful Design: The drawing mat itself is smart. With cute animals on the edge, and 7 different colors beneath the white drawing mat. Kids cannot resist the mat. Large in Size and Light Weight: The water drawing mat is 30.3'' by 30.3'' in size. There is enough space for more than 1 kid to draw on it so kids can enjoy the fun together. The drawing set is super light, you can fold it and carry it anywhere kids want to draw. A Whole Lot of Accessories: Comes with 2 pens, 1 brush, 1 design booklet, 4 sets of drawing molds, 1 set of stamps with 3 different designs and 1 magic roller. Kids can show their talent and creativity whatever way they want. a. All it requires for drawing is tap water. Mess free. b. Foldable and light-weight. Super easy for parents to put it away. c. Parents can draw with their kids and enjoy the fun together on the large mat. 1. Unscrew the pens and brush clockwise. 2. Use clean tap water to fill in the pens and brush. 3. Please avoid kids to use paint or colored pens to draw on the doodle mat. 4. The mat can only be written on with water. And please keep the mat away from heat. We aim for 100% customer satisfaction. Please do feel free to contact us if you meet any issue with our education preschool toddler toy. 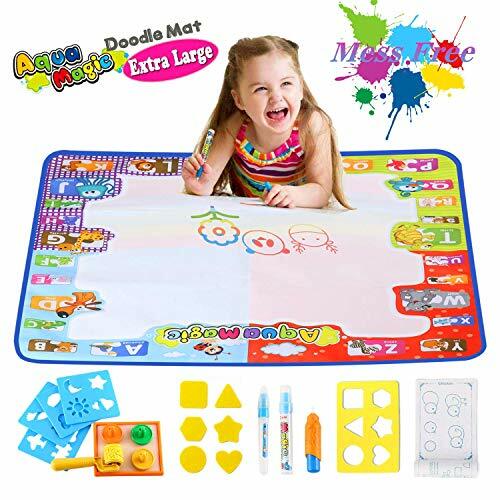  Aqua Magic doodle drawing mat of extra large size. Big enough for 2-3 toddlers to draw on. Your kids will enjoy playing on the mat together without any mess.  Comes with extra accessories: 2 pens, 1 brush, 1 design booklet, 4 sets of drawing molds, 1 set of stamps with 3 different designs and 1 magic roller. Idea kids toy as a gift.  No paint is required and all you need for drawing is tap water. It would perfectly avoid your children from making a mess.  The drawing fades away automatically 5-10 minutes after the last use, so your kids will enjoy painting on it over and over again.  Your sound shopping experience is our top priority. So please feel free to reach out to us by clicking seller name Ask a question if you have a question or you are not satisfied with our water drawing mat, we will get the issue taken care of asap. 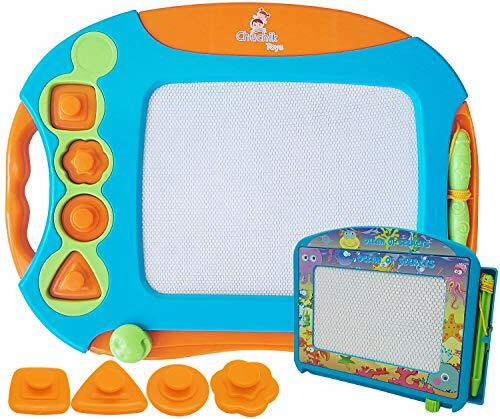 CHUCHIK Toys Best Magnetic Drawing Board for Kids and Toddlers. 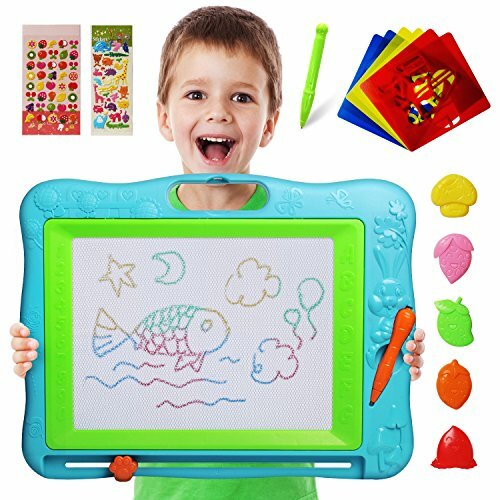 Large 15.7" Magna Doodle Writing pad Comes with a 4-Color Travel Size magnadoodle Sketch Board. "Can I give this six stars? ", "This toy is amazing! ", "It has stamps that don't fall out""The travel size board was a great plus! ", "My 2 yr old LOVES it, drags it with him everywhere!" "my little one loves it"
IS YOUR KID A LEFTY? No Problem! Our magnetic pen is attached with a nice meduim size string that is long enough to use all over the board even for a lefty and short enough to not be a strangulation danger. The String is strong too! Even if your kid will carry it around by the pen part it will still be intact. Does your kids create a mess in the room while using markers or crayons? and even write on the walls sometimes? They probably do! This is why our drawing board is the perfect product for you. it is reusable and your kids could start learning the concept of holding a pencil without making a mess. QUIET AND SMOOTH - Most boards have a rough texture surface that makes a scratchy noise when writing with the magnet pen which may even be annoying, With Chuchik drawing board it won't happen! We modified the writing surface material of the board and made it more quite and smooth, which means that while your kid is writing or scribbling you wont hear anything! YOUR KIDS/GRANDKIDS WILL LOVE YOU EVEN MORE - If you have been looking for a great gift for your little ones then your search is over! Our Magnetic drawing board makes a unique gift for a young child that will improve their basic skills of drawing, writing, counting and spelling. Don't hesitate and get one today ! You have nothing to lose with our 100% money back guaranty that insures your purchase. Click the 'Add to cart' button to order your new Magnetic drawing boards! The problem with other magnetic drawing boards is that the stamps are very difficult to get in and out from their place or that it doesn't stay put and will get lost quite easily and quickly. Our stamps connect to the board by magnets which means that your kids could take it in and out easily ! Once they put it back in place, it will stay connected and secure to the board and won't fall off ! KIDS PROOF - If you've been looking for a strong and durable drawing board, then your search is over! That's because Chuchik drawing board is build with double layer of high quality plastic which means that even if your kid step on it, sit on it or throw it on the floor it will not break easily ! guaranteed! NEED ONE FOR TRAVELS ? We got you covered ! In addition to the large size board we added a 4 color mini size board that can fit in any bag ! This is great for you because you could carry it with you for car rides, airplanes, restaurants and keep your child entertain anywhere. EASY PEASY - We improved our eraser bar and made it work smooth so it'll not get stuck halfway or make you swipe it back and forth several times. 1 or 2 easy swipes and you're ready to go again. Your kids could do it by themselves and they will not ask for your help every time they want to erase the board. 100% MONEY BACK GUARANTY ! We are confident with the quality of our Magnetic board that your purchase comes with a full 60 day no-risk, no-nonsense 100% Money Back Guarantee. Either you're thrilled, or we don't want your money! See why Amazon customers rate our Doodle board 5-Stars! Our Water Doodle Mat is a new painting toy for 2 3 4 year old girls and boys, cute ocean background with Sea World hided in the mat. Let chirldren know more about Sea world, A~Z letters and draw anythings repeately with multicolor. The water doodle mat requries water only to appear color, does not need any ink. Toddlers can doodle any pictues on the mat with water pens and brush, even use their wet fingers. The drawing mat can appear multicolor, color dissappear automatically in 3~10 minutes, then kids can doodle repeately. So it is a 100% safe toy for 2 3 4 year old with no ink, avoids any messy and saves papers. This water doodle mat is the largest size in the market, 39.3 x 27.6 inch, enough space for 4 kids to doodle together. The materail of backside is Nylon which can be folded to compact size, light weight and durable, easy to carry and store. Water doodle mat is not only a toddler toy to learn Sea World and drawing, but also a communicative link between parents and kids to share their ideas and love by drawing pictures together..
Magic doodle mat comes with a translucent storage bag instead of a box. Please choose "gift wrap" if you need it to be gift wrapped. Gift Wrap is provided by Amazon. Magic Water Doodle Mat: Water Doodle Mat is a new learning toy for 2 3 4 year old girls and boys, requires water only. It is reusable and durable. Kids can learn the Sea World and draw anythings on the mat repeatedly, doodling multicolor on the mat with WATER only, never worry about crayon, marker or colored pencil marks all over the wall, floor or funiture. The water doodle mat is No Ink, Non-Toxic, Non-Chemicals, clean and safe toy for toddlers and save parents much time to clean up. Large Size and Compact Water Doodle Mat: Our water drawing mat is large size 39.3 x 27.6 inch, designed with Sea World hided in the mat. Large enough for 4 girls/boys to play with together. Nylon material of backside can be folded to compact size and durable, easy to carry and store,portable for indoor, outdoor and travelling. This doodle mat is creative entertainment to inspire your toddlers' creativity, imagination the color perception ability. Perfect Gifts for 2 3 4 Year Old Girls and Boys: The water drawing mat is a new design to instead of traditional painting tool, saves much papers and avoids any messy. It is perfect gift for 2 3 4 year old girls and boys. 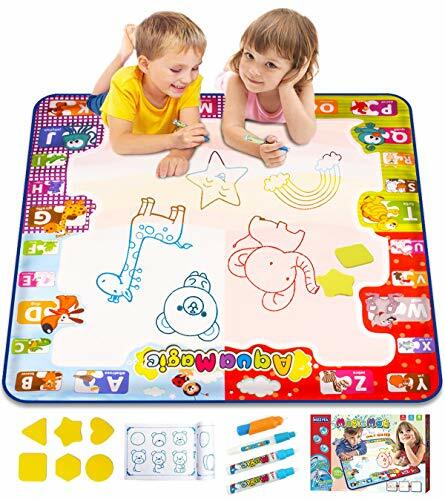 Water doodle mat is not only a toddler toy to learn Sea World and drawing, but also a communicative link between parents and kids to share their ideas and love by drawing pictures together. Great toddler toys to keep kids learning and spending happy time. Doodle With Water Only And Many Accessories : Please turn the pen cap clockwise (Counter-Rotating design) Fill with water only Close the cap Start drawing on the mat Color disappear automatically in 3~10 minutes Draw repeatedly. It comes with 2pcs Magic Water pens, 1pc Brush, 4pcs Templates, 8pcs Molds and 1pcs Learning Booklet. Kids can use the templates and booklet to learn drawing easily. Please soak the pen head for 10 minutes before use, don't pour water on doodle mat. After-sales Service 24x7 hours: Get this magic doodle mats now and start enjoying your great time with your baby! if you have any questions or meet any issue with our water doodle mat, please come back to us, we are always here to support you. KIZZYEA DOODLE MAT GIVE KIDS A MESS FREE PAINTING WORLD! Every child is a painter who has countless imaginations. As parents, we always want children to be free to paint and doodle. But we are always distressed to clean up the mess. KIZZYEA can help you solve this problem. Our water doodle mat only need water to paint, which has neon colors can meet the child's curiosity. The drawing mat is surrounded by letters, patterns, words,you can teach you kids. What a great idea to enjoy the pleasure of the parent-child time! What will the kids get from water drawing mat? 1.Before using, it is recommended to put the head of the pen into the water to soak for 30 minutes, to prevent drip phenomenon. 2.The mat can only be written with water. 3.Not machine wash, keep away from the heat. NO MESS PAINTING - As kids' parents,you may always need to clean up much mess after the kids finished their painting projects. Magic painting mat is clean and safe for children,also save your time and save trouble. Just fill up the pens with clean water and draw on the mat,no ink, no paint,no chemical.what a perfect way for the toddler to draw, won't stain the wall and floor etc. 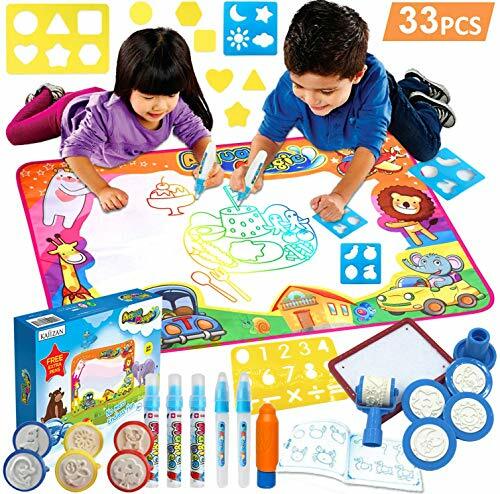 LARGE ENOUGH FOR 2-4 KIDS - The size of KIZZYEA water doodle mat is 30 x 30 inches,which can allow 2-4 kids to paint at the same time,they can share each painting ideas. The drawing mat also can be folded to compact size, portable for outdoor and travel.Let's imagine!When you are busy with your housework or have to deal with urgent things,Your child will be drawing on the mat quietly and safely next to you without disturbing you ,you will feel so great. GREAT KIDS GIFT - KIZZYEA coloring mat is appropriate for for 2,3,4,5 and 6 years old kids to enhance imagination and creativity, inspire exploration and encourage natural curiosity. Freely paint on the incredible neon colors doodle mat can promote the ability of color perception, artistic accomplishments, exchange and cooperation, even exercise hand-eye coordination. Great gift for Birthday, Children's Day and Christmas Day. DURABLE MAT - The doodle drawing mat is made of soft polyester material that is durable and safe for kids. Also can be recycled, environmentally friendly and non-toxic.The back of the mat is water-resistant nylon material, no worry about wetting the floor or painting on the desk or floor as it only paint with water. 100% SATISFACTION GUARANTEE - One-year warranty and 100% Satisfaction Guarantee.Any problem you encounter,please feel free to contact us.You will take NO RISK if you order now via clicking the Add To Cart button on this page! Crayola color Wonder inks appear only on special Color Wonder paper not on skin, clothing or carpets! 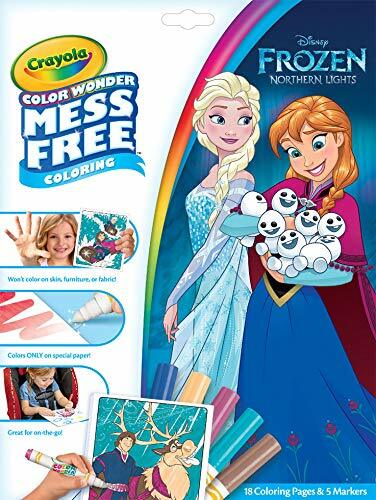 This set contains 18 coloring pages featuring characters from frozen and 5 color Wonder markers. Folder style packaging works as reusable storage for your coloring pages and markers. Works with all color Wonder paints, markers, and stamps. Makes the perfect addition to any frozen collection. Great gift for girls, ages 3 & up! Color Wonder set: contains 18 Frozen coloring pages and 5 color Wonder markers. Organized & travel Friendly: folder style packaging works as reusable storage for your coloring pages and markers. Frozen characters: pairs well with other frozen toys, letting them play with their favorite characters even more! Safe & nontoxic: gift for girls and boys ages 3 & up. 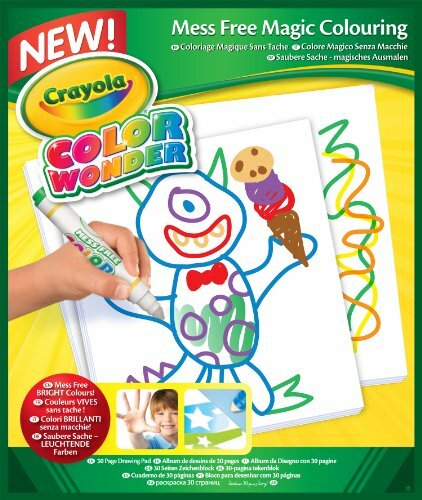 Crayola Color Wonder Inks only appear on special Color Wonder Paper--not on skin, clothing or carpets! This set contains 18 Coloring Pages featuring characters from Disney's Mickey Mouse and the Roadster Racers, as well as 5 Color Wonder Markers. Folder style packaging works as reusable storage for your coloring pages and markers. This set works with all Color Wonder Paints, Markers, and Stamps. Makes the perfect addition to any Mickey Mouse collection. Great gift for girls ages 3 & up! 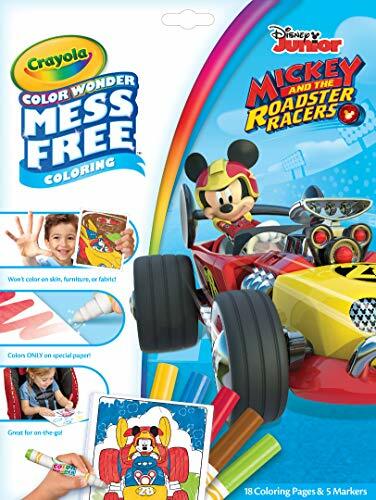 COLOR WONDER SET: Features 18 Mickey and the Roadster Racers Coloring Pages and 5 Color Wonder Markers. MESS FREE COLORING: Color Wonder Inks only appear on special Color Wonder paper, not on skin, clothing, or carpets! MICKEY MOUSE CHARACTERS: Pairs well with other Mickey Mouse toys, letting kids play with their favorite Disney characters all through the day! SAFE & NONTOXIC: Gift for girls and boys ages 3 & up! 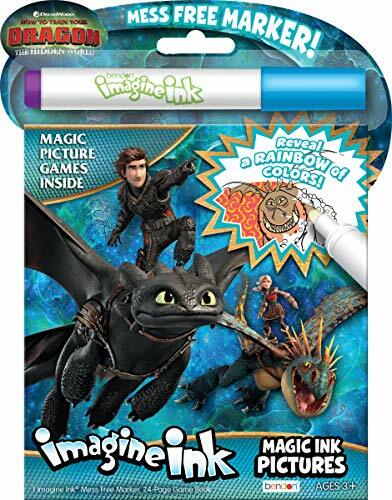 Watch a rainbow of colors appear like magic with Bendon s How to Train Your Dragon 3 Imagine Ink Magic Ink Pictures! Artists of all skill levels will love finding Toothless, Hiccup and their friends hidden across 24 magic reveal pages. Its compact design makes it perfect for travel, too! Presenting a colossal collection of coloring pages from Crayola! 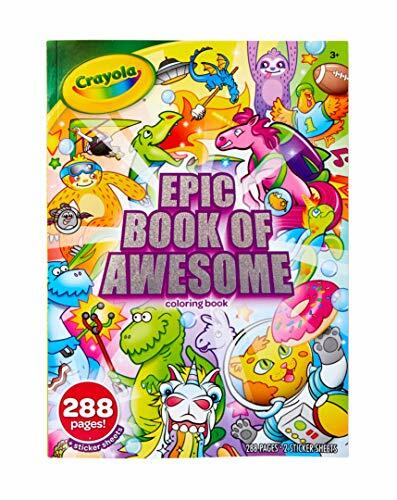 This 288-page tome offers the best of Crayola uni-creatures, sloths love llamas, Squad goals, and cosmic cats coloring books in one huge volume! Also included are 2 sticker sheets so kids can deck out their coloring art even more. This giant-sized book is the perfect travel companion for long trips with hours and hours of creative, entertaining activities for your little traveling companions. Also makes a great gift for all occasions. For an extra-special surprise, pair with the Crayola ultimate crayon collection. Ideal for kids, age 3 and up. 288 coloring pages: a delightful compilation of our favorite coloring pages from the uni-creatures, Sloths love llamas, Squad goals, and cosmic Cats coloring books. Coloring book for boys & Girls: kids love to color, and with well over 200 pages of coloring fun, this one coloring book will keep them happy through Many long road trips, plane Rides, sleepovers, rainy days, and more. Glitter animal stickers: to add to the fun, kids can use the 2 sticker sheets included to decorate their coloring pages, or wherever else they might like a bit of flair. Colorful characters: the imaginative creatures featured in these coloring pages inspire kids to be creative with their color choices, and think outside the box. These are not your everyday coloring pages, and that's what makes them exciting! Foil embellishments: kids unwrapping this fun coloring book on holidays or birthdays will be delighted by the foil enhanced cover, which features a few of the fun characters to be found inside. Gift for kids: ideal for kids, age 3 & up. 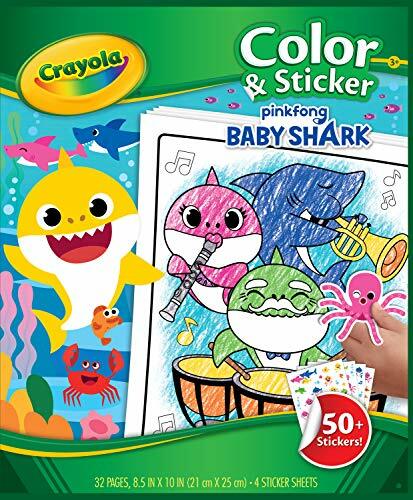 This Crayola color & sticker book offers 32 baby shark coloring pages and 4 sticker sheets over 50 stickers! Kids can enhance their coloring artwork with characters from the coolest web sensation, The baby shark song! Baby shark fans can color & sticker on the go or at home wherever they roam! Pair with Crayola Crayon & colored pencils (sold separately) for a great gift for kids ages 3 and up. Baby shark activity set: features 32 baby shark coloring pages & 4 sticker sheets. Travel activities for kids: let little ones color & sticker when on the go or at home. Pair with art supplies: bundle it with crayon & colored pencils (sold separately) for a complete coloring set & kids' Gift idea. Over 50 stickers: The Shark stickers let kids enhance their artwork with characters from the baby shark song! Safe & nontoxic: gift for kids ages 3 & up. Crayola color wonder inks appear only on special Color Wonder paper not on skin, clothing or carpets! This set contains 18 coloring pages featuring characters from Disney's Moana and 5 color wonder markers. Folder style packaging works as reusable storage for your coloring pages and markers. Works with all color wonder paints, markers, and stamps. Makes the perfect addition to any Moana collection. Great gift for girls ages 3 & up! 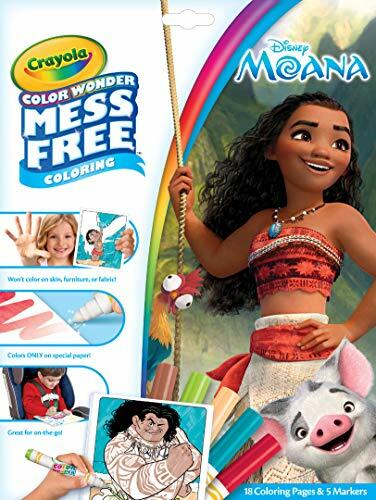 Moana coloring kit: 18 Moana coloring pages and 5 color Wonder markers. Coloring pages with character: these color Wonder pages and stickers are filled with your child's favorite Moana characters. Moana gift for girls: add to your little one's Moana toy collection at home with something unexpected and creative! Water Mat Doodle Doodle on Floor Table or on Wall --- with 4 suction cups. And it also comes with 1 water color mat, 4 pens, 1 design booklet, 6 stamps, 1 pen box with stamp pad, 1 letter template, 1 shape template. 6 Stamps BONUS --- Your little ones will love to stamp and make the doodle more beautiful. We 100% stand by our products. If any concern or questions, please feel free to contact us for replacement or refund. 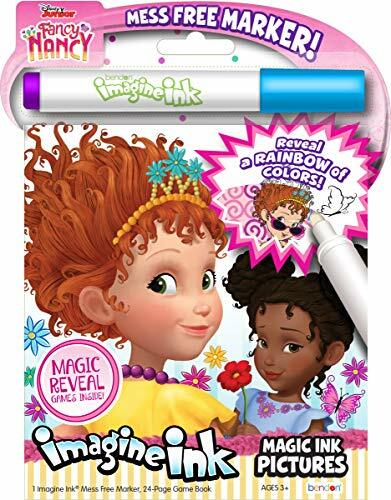 Watch a rainbow of colors appear like magic with Bendon s Fancy Nancy Imagine Ink Magic Ink Pictures! Artists of all skill levels will love finding Nancy, Doug, and their friends hidden across 24 magic reveal pages. Its compact design makes it perfect for travel, too!